On this day there is a change of time from summer to winter time. Time 2:40 + 2h is the right time. Then the time from the third hour (3) changes to the second (2), and the time zone changes from +2 to +1. The value is surprising, because the time has been withdrawn from 2:40 to 1:40 (no one knows why), and the zone has been the same +2. I would expect the driver to write to the database what has been forwarded. Please indicate how to do it or fix the error. To the Devart team: can you help me in solving this problem? We have reproduced the issue and are investigating it. We will notify you about the result as soon as possible. Is there anything known about this error? The investigation is in progress. As soon as we have any result, we will contact you. DateTimeOffset is converted to PgSqlTimeStamp by the provider before inserting it into database. Most likely, the tool you used for checking PostgreSQL entries also converted values to some specific timezone (e.g. : timezone of the workstation where the tool is installed). I understand yet that he would change the time zone, but he would change the time and not the zone, and thus the reading is wrong. We have one more test. 1) in windows, we had "Automatically adjust clock for Daylight Saving Time" enabled (I attach a screenshot). 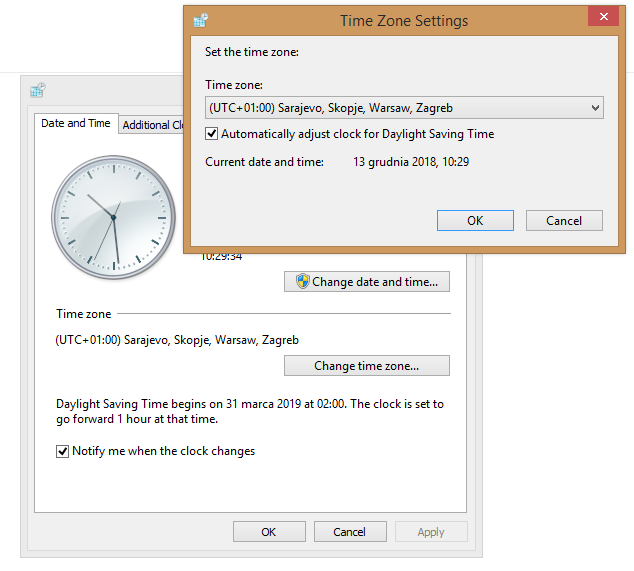 2) in windows, we had turned off "Automatically adjust clock for Daylight Saving Time"
Maybe your code somehow unnecessarily counts the DST as the operating system has turned on "Automatically adjust clock for Daylight Saving Time"? Thank you for the additional information. We will investigate the issue and notify you about the result. Do you have any interesting conclusions yet? The investigation is in progress. As soon as we have any results, we will notify you. We have fixed the issue. If you are interested in the internal build with the fix, please contact us and specify the email used when registering dotConnect for PostgreSQL. I've tested the new version. The error has been eliminated :-). We are now waiting for the official version to be published.